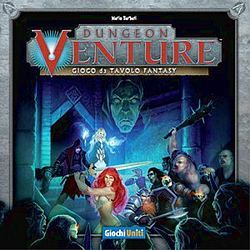 Venture, is a fast, simple game of dungeon adventuring, where brave heroes undergo a quest to foil the schemes of the Evil Keeper. The heroes adventure in a deadly dungeon, where lurks a formidable Servant of the Darkness, otherwise known as a Boss. Heroes must locate and do away with this villain, but each time a hero falls in battle, rests at a shrine, or acquires treasure, they empower the Servant of the Darkness who waits for them at dungeon’s end.